As we walked in, the front desk was front and center with multiple TV screens in plain view and a variety of shows playing on different screens. It made a great first impression to see such a high quality setup. The DISH brand was definitely well established with several back-lit logos throughout the red and black displays. 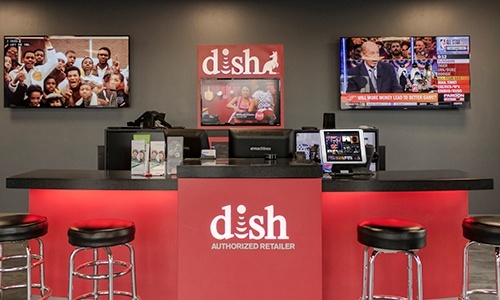 There was no question whether or not they were an authorized retailer for DISH and it created a great atmosphere where customers could relax, ask questions, and check out the top-notch TV technology. In addition to all of the TV screens and branding, there were pamphlets and other information to explain which TV package options are available to DISH customers. Plus, the employees were available to demonstrate the product and help figure out which channel packages would suit their customers needs. 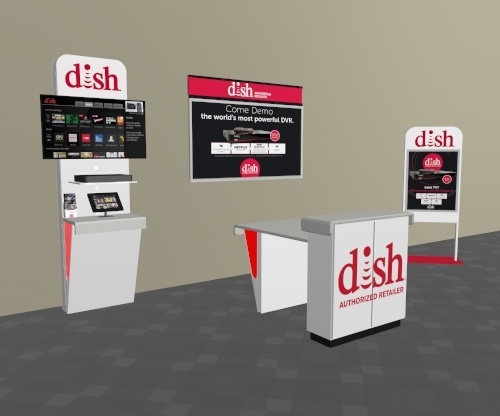 If you're not sure what to put in your own showroom, there are plenty of display options available through the DISH marketing platform. As seen in the image below, the wall kiosks, service desks, wall signs and freestanding signs are all available to retailers to help set up a well-branded display. 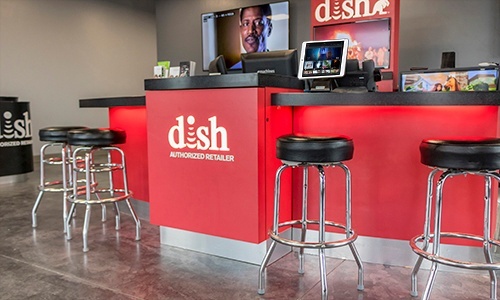 Depending on the amount of floor space you have available, you shouldn't have an issue customizing your own high quality showroom with everything DISH has to offer. You might be thinking, "That looks great, but how much does it cost?" 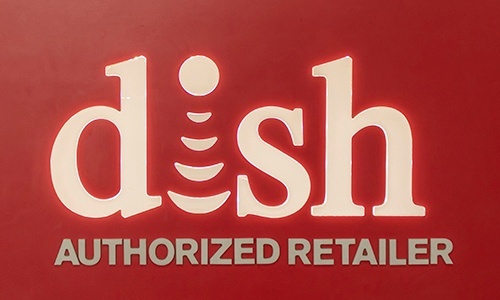 Well, the good news is DISH has financial assistance to help pay for a retailer's showroom. As you bring in customers, you start earning marketing dollars that you can use to cover up to 70% of the cost of approved marketing efforts, which includes the different displays shown above. You can also cover many other marketing tactics with the marketing dollars you earn, such as: apparel, direct mail, TV, radio, websites, print ads, brochures, handouts, banners, billboards, signs, and much more. 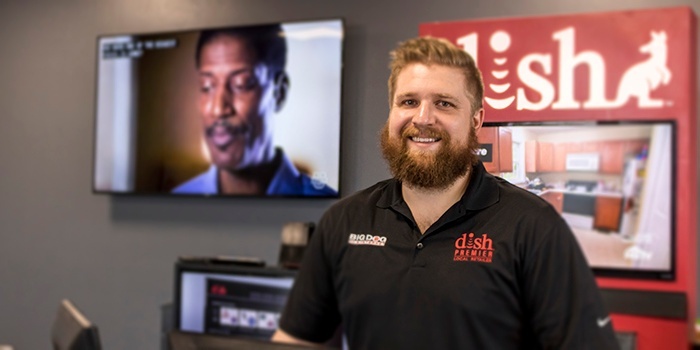 DISH doesn't leave you hanging when it comes to helping you get the word out about your local authorized retailer business! A great showroom is an excellent way to create a best-in-class DISH experience for every potential customer that enters your storefront location. It's an effective way to demonstrate the world's most powerful DVR, DISH's voice remote, hands-free TV with Amazon integration, integrated apps like Netflix and Pandora, DISH Anywhere, and even the TV outdoor solutions. There's a lot of stuff to show off! Note: The style and quantity of DISH displays may vary depending on availability, the season and as time goes on. Images used in this article are currently used styles and are subject to change.